Today, we’re offering a fresh seasonal dessert: a strawberry sorbet (sorbet aux fraises). By now, strawberries are in season so let’s enjoy them! A sorbet makes a delightful dessert — light enough for a lunch or summer dinner. Once you make your strawberry sorbet, you can arrange it in many different ways to add a lovely touch to the end of your meal – so much fun! Check the Art of the Home recipe and Art of the Home suggestions below for a refreshing strawberry feast. Enjoy and bon appétit! Bring water and sugar to a gentle boil to make a syrup (it should take less than 5 minutes). When done, place pot in cold water (in sink for example) so it cools faster (adding ice cube to the water will speed up the process). Wash strawberries first and then hull them by removing the leafy top with a paring knife. Cut in small pieces and puree. We use our food mill but a blender or food processor works as well. To remove seeds (optional), strain strawberry puree through a sieve. Pour puree of strawberries in the cooled off syrup pot and stir in lemon juice. Put mixture inside your ice cream maker or sorbet maker according to the manufacturer’s instructions. Using our Cuisinart Sorbet Maker, it is ready for the freezer in 35 minutes. It is preferable to have the ice cream maker bowl at freezing temperature before pouring the mixture so we recommend storing your ice cream maker bowl in the freezer. Transfer to a freezer-safe glass container to enjoy later. It will be tempting but you should wait at least 2 hours. Dance of Berries: add a small scoop of Chantilly cream and a few raspberries to your strawberry sorbet for added flavor. 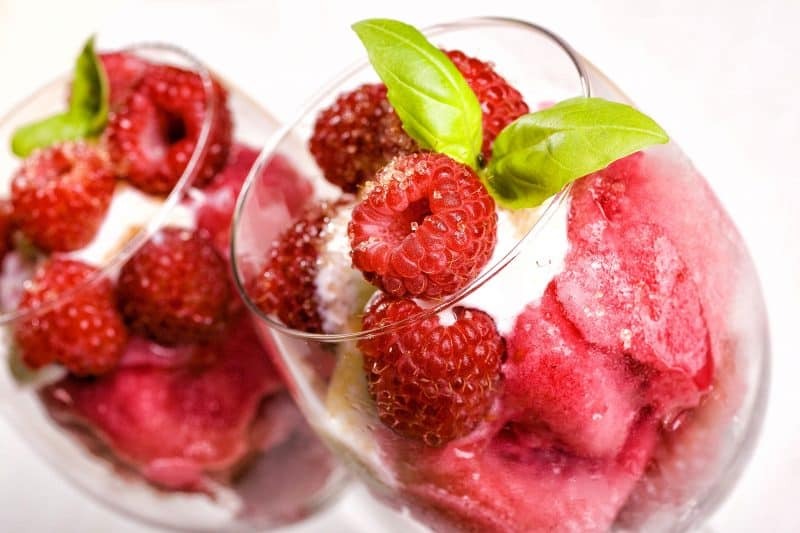 You can also serve this arrangement in glasses and you just created a “Verrine of Strawberry Sorbet with Raspberries and Chantilly Cream ” — oh là là! All-Natural Strawberry Popsicles: Transfer sorbet to a popsicle mold, children of all ages love it and it makes a healthy snack too! How to Freeze your Sorbet: to freeze as a big tub, we use the stackable freezer safe Pyrex glass container. However to freeze our sorbet in smaller portions, we use “Bonne Maman” preserves jars we have saved over the years.